Spanish police were alerted after a woman started "acting suspiciously" and carrying a large suitcase at the country's border with Morocco in the Spanish city of Ceuta, located on the north coast of Africa. Noticing her nervousness, officials at the border crossing asked her to open the suitcase where they discovered a 19-year-old man from Gabon, a country in West Africa squashed into the luggage holder and on the brink of suffocation. EL PAÍS: Spanish officials in Ceuta arrest a Moroccan woman who tried to smuggle a 19yr-old immigrant from Gabon in a suitcase. ​The Spanish civil guard arrested the woman on 30 December 2016, it is thought she could be part of a wider smuggling operation and was paid to transport the man to Spain; if found guilty, she could face seven years in jail. 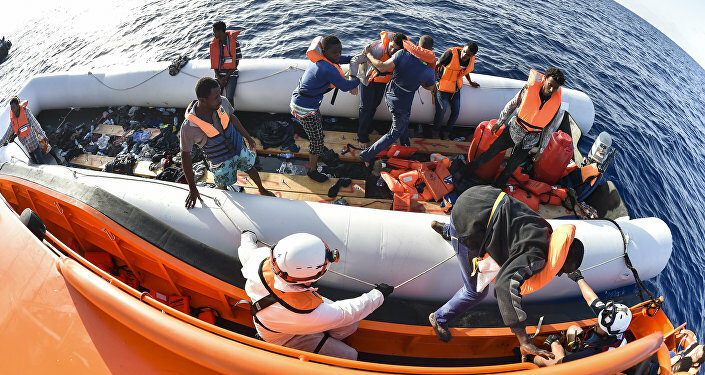 Humanitarian organizations have long been calling for safe passages into Europe to prevent the exploration of alternative routes and more desperate methods that often have fatal consequences. ​The Mediterranean Sea is now known as the 'Mediterranean Graveyard' after the deaths of thousands of migrants at sea trying to cross into Europe. ​The Western Balkan route, which became more popular among refugees, was then closed off by EU officials to migrants in 2016, leaving hundreds stranded at various countries' borders. Just before the end of 2016, Europe's largest unofficial refugee camp in France, known as 'the Jungle' in Calais, was demolished and closed down, leaving thousands of unaccompanied child refugees homeless with nowhere to go. On 1 January 2017, more than a thousand African migrants attempted to storm Spain's north eastern border with Morocco leaving more than fifty people injured. It came after 400 succeeded in breaching the six meter high fence in Ceuta in December. ​The body in the suitcase may soon be old news but it represents a new struggle for some migrants still desperate to reach Europe.